Earlier this year I blogged at length about a series of data errors, large and small, in Thomas Piketty’s bestselling book Capital in the 21st Century (a summary of Piketty’s remaining errors may be found here, and an extended discussion of Piketty’s misuse of Soviet Union data assumptions to produce a desired result may be found here). 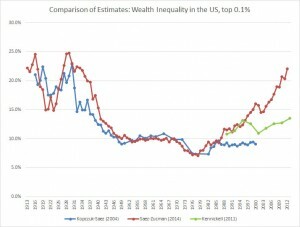 One of the main issues with Piketty’s data concerned a graph, Figure 10.5, which purported to show a dramatic increase in wealth inequality in the United States over the last 30 years. Scrutiny of this graph by myself and others (see here) called attention to a number of unconventional and suspect data handling decisions as he selectively compiled it from a multitude of sources using widely divergent methodologies. Yet when faced with these criticisms, Piketty opted to sidestep the many problems with his own chart and defer instead to a forthcoming study by his frequent collaborators Gabriel Zucman and Emmanuel Saez that purportedly validated his claimed trend of rapidly expanding wealth inequality. At the time Piketty took cover in its numbers, the public version of the Saez-Zucman “study” existed only in the form of a PowerPoint slideshow, making it inaccessible to further scrutiny. This did not stop a number of prominent economics bloggers including Paul Krugman and Brad DeLong from claiming some amount of vindication in this promised piece of scholarship. 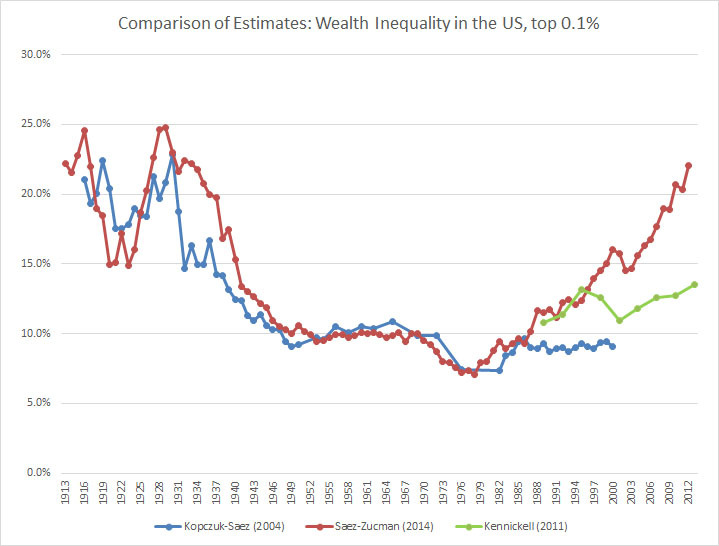 Along with Robert Murphy, I pointed out at the time that the main figure from the Saez-Zucman PowerPoint seemed to suffer from a major data problem: after closely tracking another estimate of U.S. wealth inequality for almost a century (found in a 2004 paper by Saez and Wojciech Kopczuk), their new graph suddenly diverged from a relatively flat trend line sometime around 1984 or 1985, showing that wealth inequality shot dramatically upward thereafter. As the new Saez-Zucman data therefore appeared to be anomalous when considered along side other estimation methods, I accordingly expected that much of the discussion would turn upon the presence of this discrepancy and how they attempt to account for it vis-a-vis previous work. A working draft of the Saez-Zucman paper was released earlier this month and may be accessed here. Needless to say, the anticipated discrepancy is both present and pronounced. I generated the following figure from the data appendix to Saez-Zucman along with two other estimation methods – the estate tax-based data set from Kopczuk-Saez (2004) that runs through the year 2000 and a parallel Survey of Consumer Finances estimate by Kennickell that runs to the present, albeit with less frequency in its data points. As you can see, the first diverges after 1985 and the second after 1994. The new Saez-Zucman paper attempts to address this discrepancy, albeit briefly, by attributing it almost entirely to a pronounced mortality gradient between the rich and the ultra-rich (stated briefly, they claim the ultra-rich live significantly longer than everyone else, including lesser categories of rich persons). The data set behind this claim is both lightly attested – consisting of a marked trend that is based on mortality statistics across only 6 observation points – and opaquely presented in the paper, being only lightly annotated in its presentation and mostly buried amidst the clutter of their data files. I intend to address it in depth when time permits a closer scrutiny of their spreadsheets, but after an initial read I was left with the impression that they have attempted to tackle a complex subject meriting a thorough examination in its own distinct paper by treating it in the course of a few brief paragraphs, appended somewhat carelessly to the end of their wealth inequality study. I am therefore expecting that a closer examination will reveal that, while probably warranting some consideration, the effect of the claimed mortality gradient for the super-rich on their wealth accumulation vis-a-vis the merely rich has been overstated and oversimplified to fit their new model. Given the authors’ openly stated affinity for Piketty’s similar conclusions, their proposal for a higher and radically more progressive tax structure is unsurprising. But is this prescription also a justifiable implication of a scientifically sound and impartial investigation of the data? Or do Saez and Zucman and Piketty simply have an ideological disposition toward implementing a high progressive tax structure, which manifests itself in their scholarship irrespective of the data results they obtain? Given the pronounced trend line divergences between Kopczuk-Saez (2004) and Saez-Zucman (2014), Saez’s turn of interpretations amidst conflicting data results is particularly revealing. In 2004 the flat trend line of his observation was a credited product of almost a century of heavy progressive taxation. In 2014 a dramatically opposite “new” trend line, found using a different estimation technique across the exact same period, is now a demonstration that we need…heavy progressive taxation. Given this one constant between two directly opposite results obtained by different attempts to measure the same thing, it seems difficult to avoid the conclusion that the tax hike cart is pulling the data horse around in Saez’s latest inquiry into U.S. wealth inequality.